We are also open to weekday appointments. The cost for Mobile birthday parties is $280 flat for up to 12 children and $25 per each additional child. The expected timeframe of our mobile party service is 1 hour. 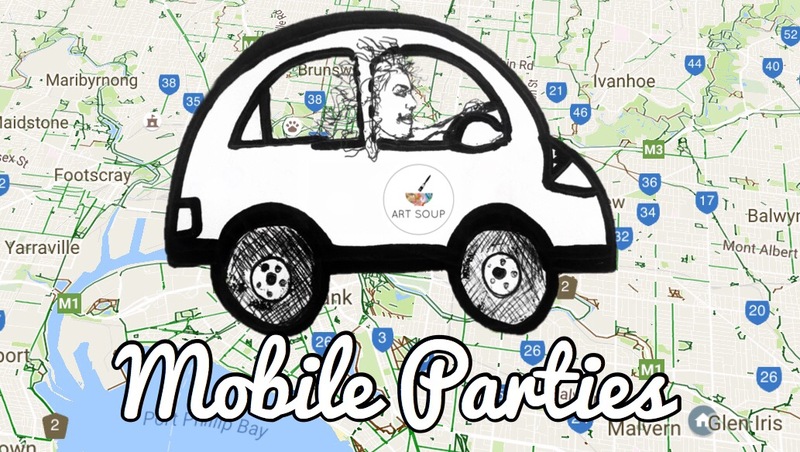 All mobile art parties include one or two party hosts (depending on confirmed amount of children) & all art supplies. At the end of the art activity we clean everything up and take everything away with us. Bedroom Lights in a simple shape of your choosing. You can have the party of your heart’s desire as specialised theme parties are encouraged and also available on request. These require a 30mins consultation with party designer Jaz and incurs a $20.00 extra fee for each consultation time. And up to 12 chairs if needed at $2.00 per chair. If instead you would prefer us to transport the needed furniture during our commute to the venue there is an additional $15.00 charge.